I copied the script to /etc/init.d, modified permission using chmod +x trial and used update-rc.d trial defaults. The file made link but when I rebooted the machine. It did not run firefox. I tried cron @reboot but with no success. I tried rc.local too again failure. But, Firefox is a graphical Web browser. As such, it needs the window server (X-Windows) and window manager to be started; and, you would need to be logged into the window manager to start Firefox. So, the task for you is to learn how to automatically start a program after you have logged into your window manager. Find the name of your window manager. Then search for help about automatically starting a program. I wouldn't expect this to work either. Even though you've wrapped the launching of Firefox in a script it isn't truly a script in the sense that it can be run during startup of the system. For example, in order for Firefox to launch it would need X running and access to open a GUI on a particular session of X.
I would attack the problem in a slightly different way using one of the methods discussed below. In particular I typically use the alternative approach. Some commands such as xset may not work from within these files. If you'd still like to automate something like this you may be able to add it as a "Startup Application". Create a shell script, xset.bash. Add a startup task to run the shell script. Once you're done OK & Close the dialogs and to test it out logout and log back in. The global autostart file, /etc/xdg/lxsession/LXDE-pi/autostart, is ignored if you have a local autostart file in your home directory, ~/.config/lxsession/LXDE-pi/autostart. If you have a local autostart file, you need to use that instead of the global one (or remove the local autostart file). Anything you put in the global autostart file will be ignored if a local file exists. 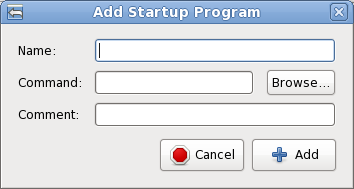 You can edit your local autostart file with: nano ~/.config/lxsession/LXDE-pi/autostart (or use your editor of choice). If the file does not yet exist, you can rule this out. Not the answer you're looking for? Browse other questions tagged scripting x11 cron startup sysvinit or ask your own question. Using rc.local to start server and then launch web-application?